Pink at Heart Fit: Go Red for Women - Blog Your Heart Out! As Heart Month continues, I am looking for more ways to raise awareness through this blog, and as I find them, I am finding more things I can do myself to live a healthy lifestyle. Today I join the American Heart Association and Fitlosophy Inc. for Blog Your Heart Out Day. As I shared last week in my Pink goes Red post, Heart Disease is the No. 1 casue of death among Women 20 and over in the United States. In fact, more women die of heart disease than the next 4 causes on the list combined. I don't know about you, but that statistic totally surprised me; more than the 4 combined. I had to wonder why, and was surprised to learn that "90% of women have one or more risk factors for heart disease", most don't even know it. Unfortunately, "only 55 percent of women realize heart disease is their No. 1 killer and less than half know what are considered healthy levels for cardiovascular risk factors like blood pressure and cholesterol". Ladies (and gentlemen) it is time to get educated!!! So in stepped the American Heart Association and the Go Red for Women campaign. This campaign began in 2004 to encourage awareness of the issue of women and heart diseas. It also encourages action to save more lives. Through their Go Red Heart CheckUp they have engaged over 2 million women to learn about their own risk for heart disease (be sure to take your checkup today). I encourage all of you who read this blog to learn your risk (male or female, there are risks, learn them and get healthy). Register at Go Red for Women, then tell 5 friends, and encourage them to learn their risk and tell 5 friends; before you know it we could reach another million ~ imagine the lives that will be saved! This is not just about today, it is about a lifestyle change, to save a life. I hope that with this blog I reach an audience that needs to hear this information, and who will join me in being more heart health. So who's with me? 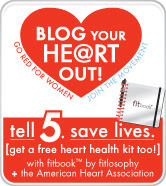 great post – and thanks for blogging your heart out with fitlosophy and the american heart association! be sure and send your page view count or subscriber #s to byho@getfitbook.com so we can tally our BIG results for the american heart association!